[April Fools] Minecraft 2.0 is Finally Coming! I don't know about you guys, but I've been ready for a change in Minecraft for a long, long time. So, it is with great pleasure that I reveal to you the next iteration of Minecraft, courtesy of Mojang: MINECRAFT 2.0!!! What does this new version include? Let's take a look at the details, courtesy of Dinnerbone, from Mojang! Added new Super Hostile game mode, for a much more challenging Survival experience. Difficulty setting is now per-world and may never be changed once set. Added new graphics setting “Ultra Realistic” with new patent-pending experimental 4D-rendering. Added new chase-style 3D camera perspective. Added new realistic food/hunger system to animals. Overfeeding animals may have a negative effect on gameplay. Added a new “Horse” animal, with two different breeds to choose from. Each animal now has a gender and personality, introducing new farming mechanics. Added a new rare breed of chicken known as a “Diamond Chicken”. May lay diamonds or lapis instead of laying eggs. May also blow up from too much pressure. Handle with care. Added new friendly Pink Wither, which is the complete opposite of a wither. Shoots out Love, which heals the nearby land and causes things to grow faster. cause up to a 200% increase in framerate. Will be fixed for launch. All animals may be fed Golden Apples to unleash their hidden magical properties (see new Magic section). Chickens are now classified as a Monster and are no longer a friendly Animal. Chickens do not appreciate being looked at and may get upset. Attacking a lone chicken may summon additional chickens to its defense. Zombie Pigmen now spawn with battlesigns and no longer use swords. Fixed a bug causing Skeletons to miss their targets on occasion. Added new Redstone Bug monster (see Redstone section). 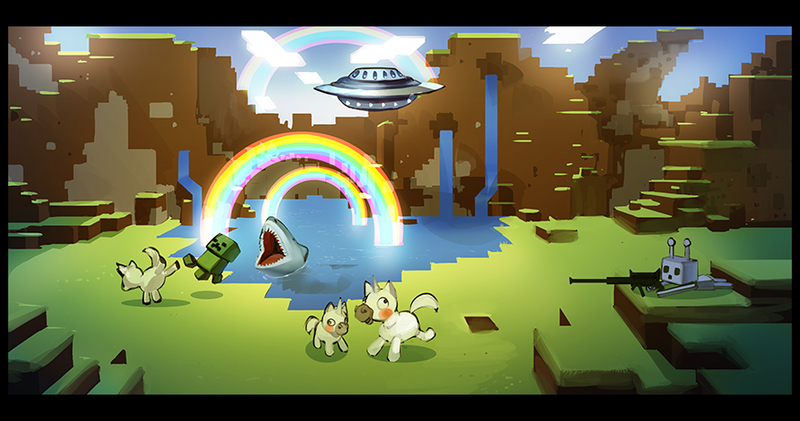 You can see all the exciting changes in Minecraft 2.0 by visiting Mojang's site: click here! SethBling to take over Mindcrack, Shows off Minecraft 2.0! In addition to changes to Minecraft, we here at Minecraft Forum are very excited to announce some really sweet changes to the forum itself! A new forum section, "Minecraft 2.0" will be added, and will be the only unlocked section of the forum. Every other section not deleted will be locked and archived. All rule infractions will now result in an email being sent to the users' parents. The staff felt that suspensions and bans were not effective, and that this new measure will be far more proactive in establishing a friendly environment for everyone. I will be retiring from MCF to pursue my lifelong dream of being a mime. Any user caught typing the word "bacon" will have their avatar changed to a pretty princess, and their user name changed to match. Private messaging and Search will be disabled on April 14th due to low usage. We know these exciting new changes will make life better for everyone here on the official Minecraft Forum! Since we will no longer have a "Contact Forum Administration" section, feel free to leave any and all suggestions you have for the new and improved Minecraft Forum in the comments below! Let me guess... April fools day? I scored 82% on the Minecraft Trivia Quiz. How much do you know about Minecraft? April 1st very funny Mojang. For the first 3 or so lines I actually took this seriously. I looked at the picture aswell. Wat skeleton with precision sniper! Shame that half of those features would actually be good for the game. Gonna love the redstone block block! OMGOMGOMGOMGOMGOMGOMGOMGOMGOMGOMGOMGOMGOMGOMGOMGOMGOMGOMGOMGOMGOMGOMG!!!!! MINECRAFT 2.0!!!! I CAN'T WAIT!!!! YES!!!! It's what I've always wanted! I HAVE A SUGGESTION FOR MINECRAFT FORUMS! Location: Where this hero is needed. "A sword yields no power if the person who wields it holds no courage." Plot twist: Turns out it's real. Why would it not be? This is all 100% Legitimate. I've just confirmed it with Sacherverell Myself. *reads 2 lines and thinks "Well done Sacheverell, best April fools joke ever." but do not forget, one day, minecraft 2.0 will actually come out. GRRRRRR my newline button does not work!